Tick Tock Property Clock – Boom or Bust? You are here: Home / News / Tick Tock Property Clock – Boom or Bust? The median house price in Sydney has reached 1 million dollars. Crazy, but what does that mean for the rest of the country? Which areas are going to follow suit? 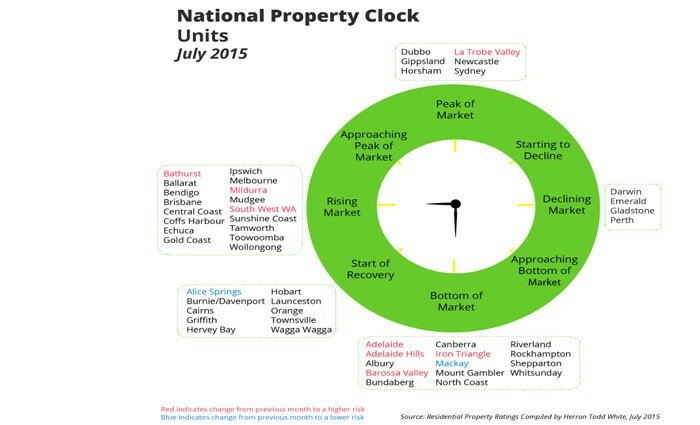 Smart property investors use the property clock as a guide. The property clock is a simplistic way to explain where different property markets are in the property cycle, investors use it as an indication on where to buy next. 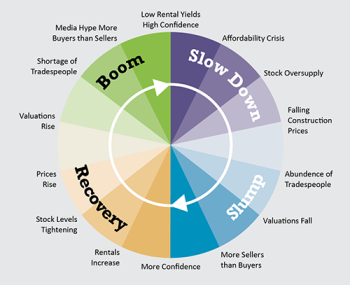 So what is the property cycle? As simply as possible the property cycle is when our population growth places an increased demand for real estate resulting in an increase in rents and demand for new homes from owner occupiers. Due to the increase of supply and demand the growth forces the property values to go up. When demand is greater than the supply prices can rise rapidly. Builders and developers keep a keen eye on the property cycle and start to construct new dwellings to meet the increased demand. However… at some point the pendulum swings the opposite way meaning there becomes an oversupply of property on the market resulting in a reduction of rental prices and a slowing of property values, and even a drop in property prices. All areas in Australia experience the property cycle at different times, and history shows us that the cycle lasts somewhere between 7 to 9 years. However, it isn’t as simple as time it also includes combined factors and influences such as social, economic and political. As an investor you will be looking at markets between 6:00 and 9:00, and closer to the 6:00 the better giving you the best pick of the available stock. Want to know more about where to invest then give The Wealth Centre a call on 1300 132 648 and we can show you the best properties to suit your portfolio for long term wealth.